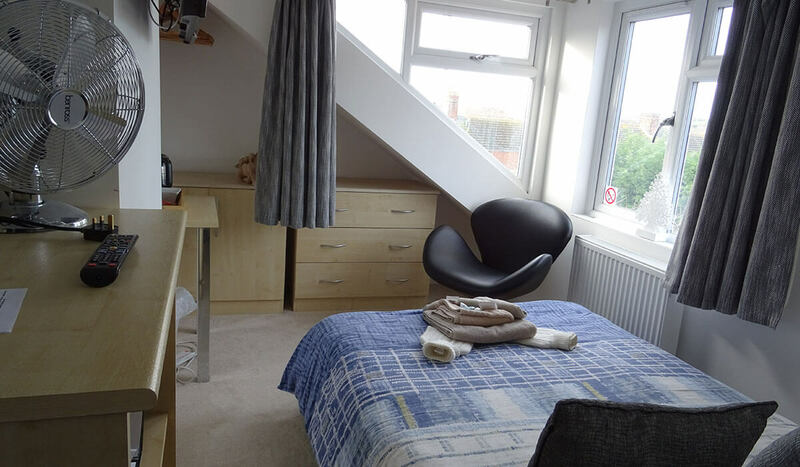 A bright and airy room compact double on the second floor. This room has an en suite with shower, wash basin and toilet. In the bedroom there is a small double bed, flat screen tv, hanging rail, cupboards, and amenities to make yourself a hot drink. There is not so much floor space in this room and only 1 armchair, so it is ideal for 1 person or a couple who don’t mind being close to each other. The views from the double-glazed window are of roof tops and gardens, looking over towards Radipole Lake and the reed beds.